Raising a family of three children and sustaining a long and successful marriage has not afforded me time to pare my nails in distant observation. I have dirt under my nails. This project (good to know my efforts here can be rendered a “project”) reflects a modern pace, whereby I attempt to get a thing done without a lot of fancy dancing around the subject. In this instance the subject being me and all the subjects that interest me. (How’s that for a circular thesis?) It may occasionally seem like fancy dancing, but it is not. I’m as straight-forward as I know how to be. Fancy I cannot manufacture. Some say the advent of the self-portrait correlates to the improvements of polished silvering in the manufacturing of mirrors. I am trying to polish my mirror and determine exactly what it holds–though I am aware of an ancient warning of this conceit. The zen master, Nangaku asked his student, Baso, what he is trying to attain by sitting meditation. “I am trying to become a Buddha,” replied Baso. Then Nangaku picked up a roof tile and began to grind it against a rock. “What are you doing, Master?” asked Baso. “How could polishing a tile make it a mirror?” Baso inquired. “How could sitting meditation make a Buddha?” replied Nangaku. 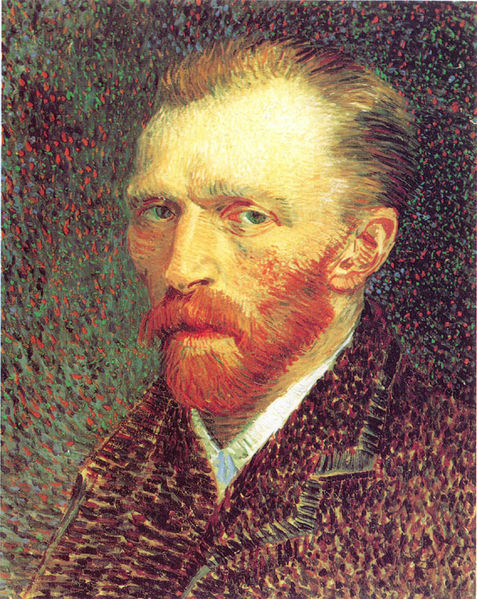 Interestingly, Van Gogh’s self-portraits are all of the left side of side of his face, the right side sporting the mutilated ear. Can a person peer so deeply inside, yet expect to hide the obvious? Is that not whipping the cart? Call it self-knowledge, enlightenment, clarity, t/Truth–the ox is to be whipped.